Shawn “Dj Oxygen” Dillard, hailing from Trenton, NJ, is a professional DJ, and the founder of the country’s first accredited Sound Engineering and DJ Academy for High School youth. 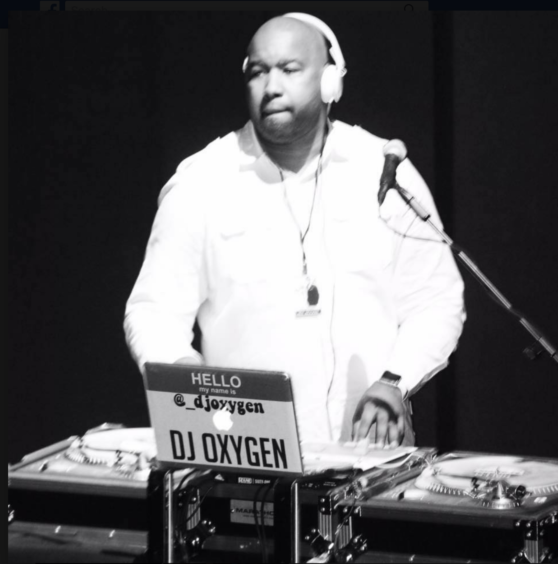 Shawn “Dj Oxygen” Dillard, hailing from Trenton, NJ, is a professional DJ, and the founder of the country’s first accredited Sound Engineering and DJ Academy for High School youth. Formally trained by DJ Eric B. of the 80’s rap group, Eric B. and Rakim, DJ Oxx has been a professional DJ since 1989. Over the years, Dj Oxx has continued to DJ large events throughout the country, perfecting his craft. He is respected for his gift to keep crowds dancing and is a well-known Party DJ. His skillful beats has landed him work with some the industry’s greats, such as the Notorious B.I.G. – his historical mixes are a documented part of hip history, in the hit song “One More Chance.” He’s also worked throughout the years with Kid Kapri, Ludacris, Kenny Burns, Redman and DC’s own Experience Unlimited (EU). In 2011 Shawn saw an opportunity to give back to the community by offering some of the most problematic students an alternative to the path of dereliction on which they were traveling. He decided to share his passion for the art mixing music with some his student, offering DJ skills as a marketable trade which has enabled students to earn honest income, as opposed to some the quick cash alternative that they were seeking. Since 2012 Shawn’s Youth DJ Academy has trained 80 youth DJ’s, who now serve as DJ’s for public sponsored events.